Blogging Through the Bible in 90 Days: Belated Greetings! 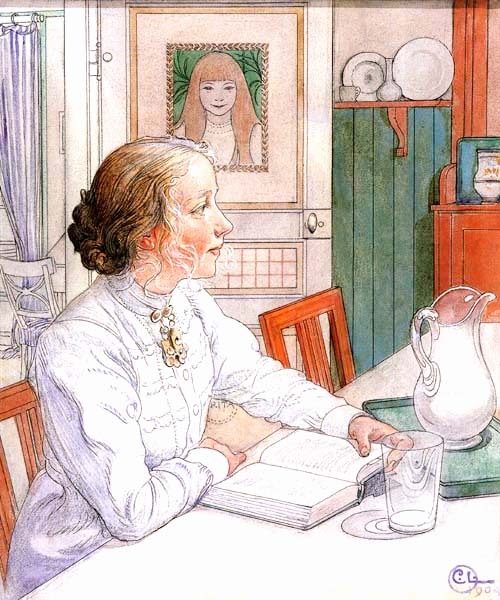 "Suzanne With Milk and Book," Carl Larsson This is not a picture of me; in fact, this looks absolutely nothing like me. (Think short, chubby, longer in the tooth and brunette.) But it is a woman reading, which is what I intend to do. I am a part of the RevGalBlogPals webring, which is how I found out about this project. And I have just completed my first year of lay ministry training, a really exciting and rigorous course of study for laypeople with "day jobs" who want to serve their congregations and other ministries within our synod of the ELCA in a more informed way. A significant part of our studies, of course, involve Scripture, and in the past year I've read significant chunks of the Old Testament, but not the whole thing, and not in a sequential way. I also try to maintain (emphasis on "try") a daily discipline of following the Daily Office, which is also a good daily dose of Scripture, but not a comprehensive read-through. At one point I tried following Dietrich Bonhoeffer's advice of reading a chapter of Old Testament and a chapter of New Testament every day, all the way through the Bible, but I couldn't maintain that slow a pace -- I'm more a "I'll take that triple espresso to go" personality. So I am looking forward to challenging myself through this process. Did you manage to read the "12 pages"? I read it "just hanging around" at home. I'm not a note-taker/highlighter/underliner; I'm just doing a "What does it say?" read-through right now, and as I finish books I'll go back, read the footnotes and other helps (I have a New Interpreter's Study Bible with a lot of reference materials -- usually about only half the page is text; the other half is footnotes, excursuses, etc.) and think about "What does it mean?" and "What does it mean for me right now?" There's a definite rhythm and pattern to the chapters. And frankly it's been really hard for me to slog through the geneologies; I know that they were important to the authors/redactors as "authenticating" parts of the narrative, but...hey, they're boring to me. And I find the general lack of acknowledgment of women irksome. GREAT that you've jumped aboard! Hi, Richard. Are you talking just to me, or to the other bloggerians here as well? If referring to me: My own blog is principally about my faith life, but also about my life in general...like a typical Lutheran potluck (one of our favorite bonding rituals), it's got a lot of different things on the table. ;-) I think that the best way -- the only genuine way, really -- of conveying Christianity to others is in a relational, transparent way; letting others see what our lives actually look like -- good, bad, ugly, clueless -- and how our Christian faith informs them. And the blogosphere is an excellent way to do just that. Thanks for stopping by. Lorna: What's interesting is that my classes last year -- which were all OT -- are giving me kind of a slacker's attitude toward Genesis, which we actually did cover quite comprehensively; and I also took an online class on Torah from a rabbi, so I wound up reading much of it multiple times. Anyway, I find myself not paying as much attention as I probably should to some of the more important stories...I think, "Isaac on the altar...yeah, yeah...Rachel and Leah...yup, got that..." What will be interesting is when I wind up in some of the less pivotal texts that we really did not cover in great depth in either of my classes; I think it's going to make me slow down and actually think about what I am reading more. Training's going great, BTW -- just finished my first year, was accepted as a candidate and not merely as an applicant, and have also embarked on a regular gig assisting our pastor...there are four of us in the congregation with varying degrees of ministerial training/experience, and we're each assisting once a month. I love it. And our pastor appreciates the help. Composing and praying the Prayers of the People is one of my very favorite tasks -- it's a great responsibility, but also a great joy, to lead the congregation in these petitions on behalf of "the whole world, the whole Church of God, and all according to their needs."